Once you have defined your inboxes, the next step is to make sure that your inboxes are always empty by the end of the day. This is obviously challenging, since items from various places are constantly filling them. Processing these items does not mean acting on each and every one of them. It just means examining each one, identifying what it is, and deciding what action to take on it. Junk mail – These are useless items that don’t require any action on your part. Thinking about them is a waste of your time, and the best thing to do is to delete them. General mail and reference items – These items do not have an action associated with them, but they are something valuable to you. For instance, it could be a business card or phone number of a new contact. This is a reference item that should be saved or entered into your contact database, but there is nothing much else do it. 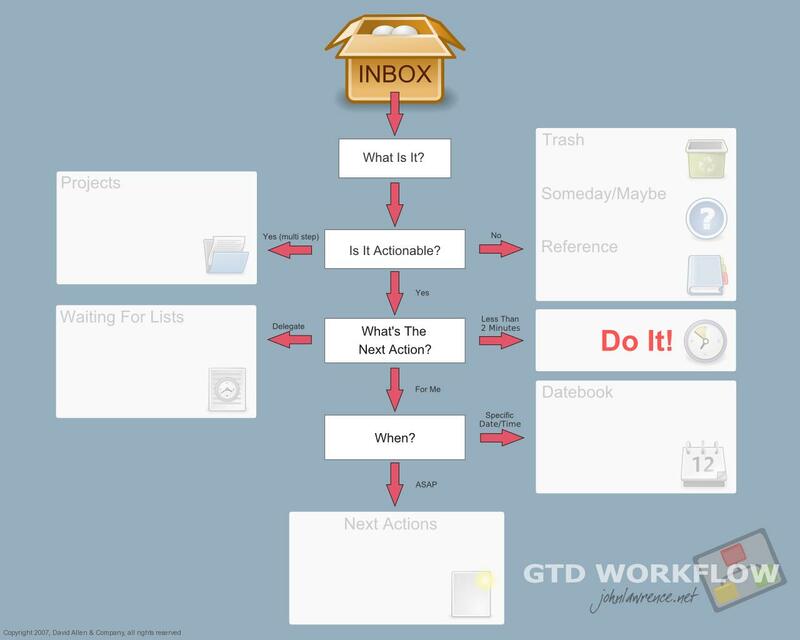 Action items –These are the most important items in your inbox and actually create your daily work schedule. They include bills that you need to pay, reports that you need to write, and office tasks that you need to complete by the end of the day. This group also includes items that have an action, but not something to do immediately. You can’t act on them right now, but you can schedule it for later. Once you identify all of the items in your inboxes, emptying your them is just a matter of categorizing them and taking them off your mind. Junk inputs can be discarded, reference items can be stored in your reference system, and action items can be placed on your to-do list. Once you take them off your mind and put them on a list, they can be removed from your inbox and it goes back to empty. Of course, there will be moments where you are not sure how to classify certain items. In these instances, you may think of keeping them in your inbox, but you should resist the urge. Do not defer from making a decision because it is not comfortable for you at the moment. If you are waiting for more information, put it in your action system so that it no longer remains in your inbox. You should be able to process your inbox like this at least once in a day, preferably at the end of your day. It should also be done quickly so that you do not feel too overwhelmed with the tasks in hand. If you have a lot of old tasks and inputs to be processed, you should still get your inbox empty quickly. This might mean going through thousands of emails, and in this case you could create a separate mailbox for old emails. This way you have the old emails for reference and still have a completely empty inbox. The main idea is to get your inbox completely clear at the end of the day and keep it that way. Do you empty your inboxes daily? If so, what tools and techniques do you use? Comment below. If you are an Evernote user and would like to integrate Getting Things Done with Evernote, check out Evernote: The Unofficial Guide To Getting Things Done. This eBook will help you to become more productive by combining Evernote® with the best practices of the Getting Things Done methodology. It has helped over 13,000 people become increase their productivity over the last 12 months and it can help you today. Purchase a copy here.